The Student Accountant, Issue 1 -- Official Site Book Released! Welcome to the first issue of The Student Accountant, the official E-newsletter of Accounting-Basics-For-Students.com! And along with that welcome… a Happy New Year to you too! 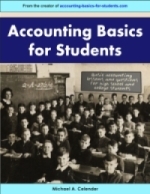 In case you haven’t visited the site for a while, we just recently released the official Accounting Basics for Students book. - a bonus article on How to Pass (or Excel in) Your Accounting Tests and Exams. The book is available now at a special introductory price. For more information go to the Accounting Basics for Students book web page. In each issue of The Student Accountant newsletter, we’re going to list some of the latest questions from accounting students that have been posted on the Accounting-Basics-For-Students.com website regarding any accounting lessons and topics. Some of these questions may not be of interest at all… If so, no worries, you’re not expected to read each one. Just browse through the list below and click on any questions that interest you to see the full article, and just skip the rest... Also, feel free to submit comments on any of the questions/articles themselves. Does the Provision for Doubtful Debts Go into the Sales Control Account? What is Double Entry Accounting and Who Introduced Double Entry? You can see a full list of the latest questions, lessons and articles by visiting the Accounting Basics Blog. And you can submit your own accounting questions at the bottom of the page of every lesson on the site. We want to know what you would like to see in future issues of this newsletter. Click here to contact us and let us know what information you would like covered. If you’re not exactly sure, we’ll give you some ideas a little lower. There are also a bunch of interesting new sections that we plan to add to the site to provide more value to you, the student accountant. But before we add these sections and send you more newsletters, we want to make sure we’re providing what you want. So, please let us know what you would like to see on the site and in future issues of this newsletter. Hope you enjoyed our very first issue! © Copyright 2009-2012 Accounting-Basics-for-Students.com. All Rights Reserved. I promise to use it only to send you The Student Accountant.